Dear all, it’s been a while but finally I feel compelled to put digit to keyboard and hash out another blog piece. The inspiration for this? Well, I am currently in the process of revamping my website and in doing so I wrote a couple of paragraphs about cuisine in India, and trust me, it’s not easy to sum up all of India’s culinary wonders in a couple of short paragraphs. I started with mangos, and went, on a very circular route via, amongst others, Malabar Fish Curry and Jungly Mas to pomegranate with mangos. (Needless to say Didi, dokhla didn’t get a mention). Naturally this got me reminiscing and promptly, zealously salivating, (Pavlov’s dogs have nothing on me) about India and more pertinently, breakfasts in India. Delightful, delicious tasty breakfasts that make one jump for joy and start the day with glee. On my last visit, day one saw me served with dosa, my friends know me too well. 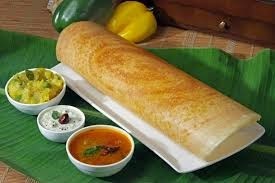 But not masala dosa, or plain dosa served with coconut and tomato chutneys and sambar (Oh Rasam – how I miss you!) but Amma’s dosas (plural of course) served with home-made gunpowder (ground lentils with chillis for those who may be wondering) – I am drooling at the memory. Day two was aloo paratha with heaps of pickle, so simple, yet such gastronomic heaven, ripping it apart with your hands and dunking the warm, succulent bread into the pickle. Licking the butter infused tiny atta grains from your fingers….. ahhh! 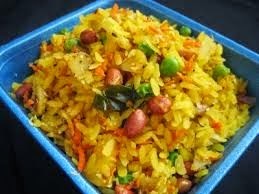 Then day three, oh I can hardly type for the exquisite memory this has recalled, poha! Now I have Mr Holkar to thank for that discovery, for it was at the magical and heavenly Ahilya Fort that I was first introduced to this epicurean delight. Not knowing what it was, but feeling certain it would be more interesting than cornflakes or toast with (albeit home-made) jam I ordered it and I was not disappointed. There soon arrived a bowl of delicious turmeric infused crushed rice grains scented with mustard seeds, onion, curry leaves and green chilli’s, scattered with peanuts and with, their particular piece de la resistance, a sprinkling of pomegranate seeds – I thanked the gods, all 300,000 of them whilst savouring this newly discovered yet immediate firm favourite. By the way, discovering my penchant for this dish, Jyoti surprised me with Poha on my most recent stay at Devra – anything Jyoti cooks is divine and this was no exception. Day four naturally left me in a quandary. Not, what should I have next now that my first three had been enjoyed but which should I have again and so started a rota that saw me bounding out of bed and rushing to start the day with a fervour never EVER encountered by the prospect of a bowl of cereal, no matter that my own muesli is of the finest home-made variety. I have tried jazzing it up with different dried fruit and nut combinations but to no avail. I am not an egg person, though I do make an exception for the scrambled eggs served at Abbotsford in Nainital, so Sunday saw me try and break out of the breakfast torpor with a big fat bacon sandwich, chopped in two and one half served with good old HP sauce, the other with ketchup and mustard (English mustard I am not 100% biased) but no, even so, I wasn’t thrilled and excited and salivating at the prospect and was still sluggish as I dragged myself down to the yard. It is not even just the main event of an Indian breakfast that does it for me. Invariably there is a amuse bouche of fresh and tasty, tasty fruit (yes fruit in India tastes like fruit); papaya, watermelon, mango, pomegranate or my particular favourite – the mango and pomegranate combo. And of course, all the above is washed down with a cup of sweet, delicious chai. You will have seen my recipe for Indian chai on a previous post. Dhiraj and Kalpana my trusted driver and maid, would wait for me to make the morning chai, which must never be rushed, either in the preparation or the drinking thereof, scented with ginger and cardamom. It doesn’t matter how many times I have tried to recreate this in the UK, I have even had cardamom sent over, as fresh as fresh can be from friends in south India, it just doesn’t taste the same. I shouldn’t really complain, I do get to start my day here with a cup of pure organic green tea from Makaibari – which incidentally has recently achieved the accolade of being the most expensive Indian tea – thanks to Rajah Bannerjee who has kindly and generously kept me supplied throughout my incarceration in the UK and who has a feature on my newly revamped website , did I mention that I am revamping my website? Naturally this is then followed by a ‘Yorkshire Tea’ chaser. Incidentally, does this strike anyone as odd? I mean Yorkshire Tea is a cracking brew but their tag line ‘Made for Yorkshire People and Yorkshire Water’ Really? When it is being plucked in India and Rwanda are the workers really considering us hardy folk in Yorkshire, determining which leaves go to Yorkshire and which get sent to the rest of the world? And I have only recently run out of gunpowder which I have been carefully eking out, spreading it far more thinly than the taste sensation which it delivers deserves onto slices of toast. But as I sit here and reminisce, and salivate to the point of dehydration, I wonder for how much longer I will continue to want to get out of bed each morning to be faced with yet another bowl of bloody cardboard flakes?